Women make up a majority of the US population. They earn roughly 60 percent of undergraduate degrees, 60 percent of all master’s degrees, and nearly 50 percent of all law degrees and medical degrees. Yet women remain underrepresented at every level of corporate America, from entry-level positions to the C-suite. 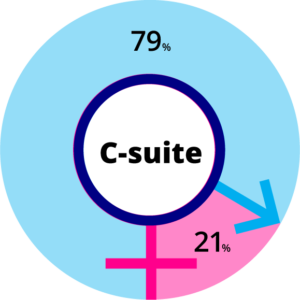 Last year, just 21 percent of women held C-suite level positions compared to 79 percent of men. Not surprising when women remain significantly underrepresented in the corporate pipeline. At the entry level, women made up 48 percent of those positions. At each ascending step of the corporate ladder, the pace of men outnumbering women grows exponentially. “There is a common argument that diversity hiring is difficult because there is a supply issue. But that’s not true. It’s a demand issue,” explains Teresa Tanner, chief administrative officer for Fifth Third Bank. Tanner and other executives across the US business landscape are not only incorporating more initiatives to help women develop into leadership roles, but they’re also helping to change a preconceived notion about women in the workplace contrived decades ago. Tanner says that when she came to Fifth Third more than a decade ago, the company did not have a particularly diverse workforce, especially when it came to women in leadership positions. To address that leadership gap, Tanner created Women in Leadership—a nine-month class that offers accelerated learning opportunities for up to twelve senior leaders with C-suite level potential. Efforts such as this—along with the internal women’s business resource groups, intentional job rotations, and increased public awareness—have resulted in women now making up about one-third of Fifth Third’s board of directors, including its chairwoman, Marsha Williams. Strong initiatives alone will not narrow the leadership gap for women. Instead, there needs to be a commitment from everyone to enable opportunities for inclusion. Keith Krach, chairman and former CEO of DocuSign, says women are among the most underutilized members of our global workforce, and the tide needs to change. Part of that leadership gap as well is the lingering persistence of preconceived gender stereotypes. Tanner has firsthand experience with navigating the twists and turns that come with gender issues in the workplace and the broader society. Her husband retired when their children were young so he could stay home and she could continue her career. The fact that his decision hasn’t been as socially acceptable as she would like indicates that those stereotypes are still prevalent. Women are less likely to receive advice from managers and senior leaders on how to advance, and employees who do are more likely to say they’ve been promoted in the last two years, according to the Women in the Workplace report. Laurie Krebs, global vice president of tax for Red Hat, says that in her previous tenure at Nortel, there was no mentorship program at the time, so they started one. Lower-level female employees were matched with upper-level male and female managers, and the lower-level employee created agendas for one-on-one meetings with their mentors. The group also brought people in to speak on women’s issues, including empowerment, and also had other influential women in the community to speak on their careers. Having joined Red Hat in 2017, Krebs says she was fortunate to be part of a company that not only favored the idea of a women’s group, but also encouraged and celebrated it. The company’s finance department employed more than four hundred people, and half of these employees were women. Krebs told the group about what she had done at Nortel, and other women leaders in finance joined in to share experiences as well. As these leaders explain, changing the tide is a responsibility that every leader must share, and only their collective efforts will narrow the gap for women in leadership positions.